Today Timesulin, the little company that makes this great insulin timer cap, goes live with a crowd funding campaign on Indiegogo. If you want to send a message to the FDA that we in the States should have great, useful, life-saving products as quickly as anyone around the world, sign up at the link above. I’ve been using this cap for more than two years, since the day I met John at the IDF World Congress in Dubai. I can’t tell you how many mornings I sit down at this computer, start working and wonder whether or not I took my long-acting insulin shot. Timesulin always lets me know. The reason I love this cap. Share the news – yes we can get products over here that we want and need faster by pulling together. Would it surprise you to know, Timesulin is already in 40 countries around the world? Be part of the solution and you and millions will benefit. I haven’t posted anything in a while because I’ve been away on vacation, but I did write two articles just before I left that are well worth a look if you haven’t seen them. 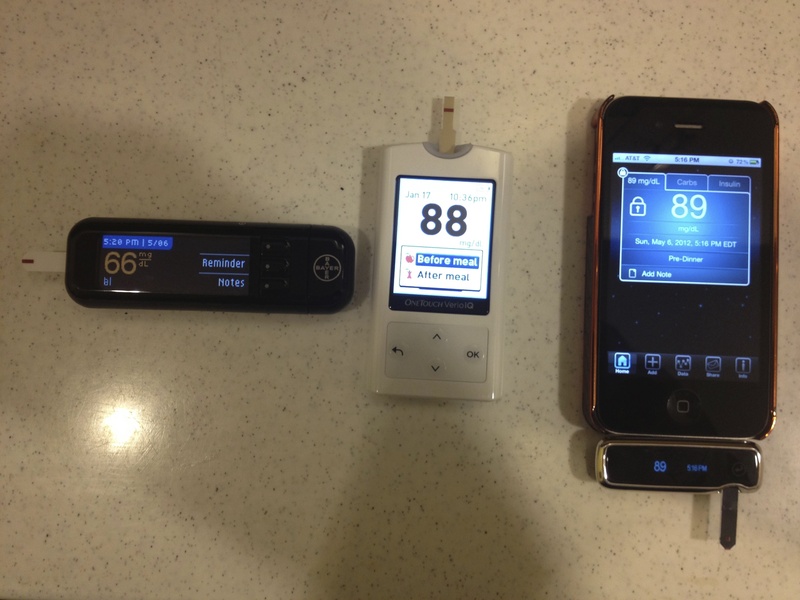 Both articles are about our blood glucose meters, why they give us the numbers they do, and why that’s critical to managing your blood sugar. What you should notice in the picture above is almost all the meters show different numbers on them ranging from 99 mg/dl to 118 mg/dl. I took my blood sugar on all of them at the same time and with the same drop of blood. You’ll find the post about what other things are just as important as our glucose numbers in managing our blood sugar in the article, “Meter Accuracy Counts More — and Less — Than You Think” on the Huffington Post and information about how meters really work in, “Why Meters Can’t Tell Us Our Blood Sugar Levels” on DiabetesMine.com. Be prepared to be surprised. On the vacation note, sad to say, I returned on crutches. While taking a lovely walk through the charming town of Leiden in the Netherlands, I tripped over a cobblestone curb and ended up with a sprained ankle. I’ve been trying out a new lancing device sent to me by the public relations firm for One Touch. It’s called the OneTouch® Delica™ Lancing System and it’s available now at some retailers and will be available across the country mid-July. I thought that would be that, and I’d return to my tried and true Accucheck Multi-clix. This is my favorite among typical lancing devices because it’s less painful and 6 lancets come in an easy-to-load drum. But, I surprised myself. Every other time I lanced my finger I would reach for the Delica™, sturdiness be damned. I did actually find it less painful than the Multi-clix. And now I use it more often than my Multi-clix. Of course, I don’t change the lancets each time, probably after 6-10 finger pricks, and I’ll soon run out because my sample only came with 10 lancets. So I leave you to decide for yourself. The OneTouch Delica System features a new, proprietary 33 gauge lancet that is 40% thinner than current industry standard 28 gauge lancets. In a clinical study of nearly 200 people with diabetes, 4 out of 5 reported the OneTouch Delica Lancing System was virtually painless/pain free and the most comfortable Lancing Device they have ever used. And yes, I can attest to its non vibrating motion and 7 adjustable depth settings. The estimated retail price is $19.99 and includes 10 lancets. 100-count OneTouch Delica Lancets have an estimated retail price of $15.99. Both the device and lancets are covered by Medicare Part B and most private insurance plans. Turns out quite by accident, Amy Tenderich over at DiabetesMine is also reviewing pain-free lancing devices today, so you can catch additional info. As for me, I still like that my Accucheck Multi-clix is sturdy, easy to hold and load so it doesn’t require fussing or touching the needle. Guess, I’ll have to make the big decision when my Delica™ lancets run out. Diagnosing diabetes with the A1C may mean you’re cured! A fellow type 1 friend of mine was trying to get a CGM to better control her blood sugar. She’s had diabetes for more than two decades. Her blood sugar bounces from high to low often enough that her doctor felt a CGM would be extremely helpful, even though her A1C is just below the American Diabetes Association recommended 7%. Of course the A1C is an average of your last two to three month’s worth of blood sugars. That means you can have lots of blood sugars around 250 mg/dl and lots around 50 mg/dl, and average out at 150 mg/dl – just below an A1C of 7%. While this averaging game is nothing new to me, what was new to me is that her insurance company would not cover a CGM because the liaison between the insurance company and the CGM company said my friend’s diabetes was cured. Why? Her A1C is under 7%. My friend’s doctor told her he’s seen this coming ever since companies decided to diagnose type 2 diabetes with the A1C test. The American Diabetes Association has recently recommended this along with an international committee from several other diabetes organizations including the International Diabetes Federation and the European Association for the Study of Diabetes. One main advantage they cite for using the A1C test to diagnose diabetes is that it can be taken any time of day, and without fasting. Yet, at what cost does this come? If an A1C of 7% or above will mean you have diabetes then will insurance companies say a well-controlled diabetic, who has an A1C under 7%, does not have diabetes? If that’s the case then I’ve been cured for years and didn’t know it. Funny, though I still experience hypos and highs no non-diabetic gets. Will patients lose having tools that could help them better manage their diabetes with this diagnosing criteria? I know one who already has. Today I’m truly excited. Today Medingo’s new Solo MicroPump the tiniest, thinnest, lightest, tubeless pump is almost here. Yes, apparently almost. If you sign up here they will let you know when it will be available in your area. When I give a diabetes presentation, people always ask me whether I wear an insulin pump, and the answer is “no.” Primarily it’s because I’m used to injections and don’t mind them, I’m able to keep my A1C in the nondiabetic range through careful attention to my eating, exercise, and general health, and I don’t want to have a piece of equipment attached to me. However, as I have told everyone, and will go on record as saying, when the insulin pump is closer to the size of a credit card, I will be the first one in line to get mine. 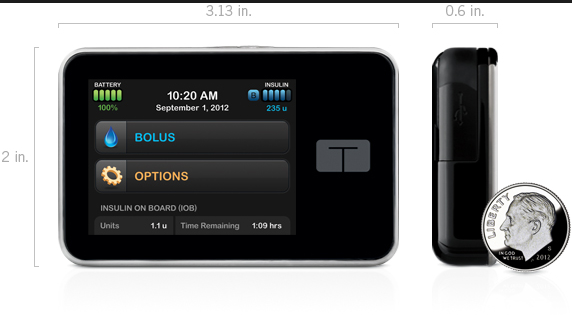 In full disclosure, I haven’t seen or tried the pump but I am, for sure, looking at a new generation of insulin pumps that Omnipod began. Two years ago I participated in the focus group for Solo MicroPump and the prototype for it has been sitting here beside my computer since. It has been a symbol of hope for me that the product would actually come to fruition one day. 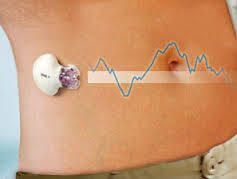 Like Omnipod, which I wore for a few hours to experience the feel of it but didn’t use because it was too big and clunky for me, the MicroPump is tubeless and is operated by a remote control. The MicroPump consists of two parts, an insulin reservoir and pump base. The reservoir holds 200 units of insulin and the video text says is replaced “when empty.” However the video voiceover says, “according to your insulin manufacturer’s recomendation.” So, I’m not sure what that means. The pump base is replaced every three months. There is automatic cannula insertion like other pumps. But unlike the Omnipod, you can disconnect this pump for short periods of time, you don’t discard it but refill it, saving you space and storage, and even if your remote is not with you, (I just know this will happen to me!) you can bolus by pressing buttons on the side of the pump. So now all that remains in my mind is do I want to try the first generation or wait six or 12 months for the second? If you’re at the AADE conference this week, the Solo MicroPump is being introduced in the exhibition hall. Would it surprise you to know that the meter you use to test your blood sugar may be wrong by 20%? And that a 20% margin of error for many patients results in seizures, unconsciousness and coma? This past June the international group that sets the standards for meters was pressed to tighten them, and we can only hope it’s happening according to the recent article in the New York Times, “Standards Might Rise on Monitors for Diabetics.” Officials said they would keep pushing until monitor accuracy improves. But it makes you wonder how those who oversee meter accuracy could be so casual and negligent in the first place. Insulin is a dangerous drug, take too much you could die, take too little and high blood sugars will lead to complications; we’re all depending upon our blood sugar readings to keep us from harm. If my meter shows 100 mg/dl my blood sugar could be 80 or it could be 120. 80 means I’m close to caving and may need to take some extra sugar, however if I’m really 120 extra sugar will push me into high blood sugar. Something as simple as Tylenol or Vitamin C may also give false readings. In a world where we can land on the moon and talk into a wireless phone and get your email on a two inch screen, can we not create meters that give accurate blood sugar results? A government study revealed among five popular meters, results varied up to 32%! Two meters, both made by Bayer, differed by 62 points! Really I find it shocking that with diabetes on the rise and health care costs skyrocketing, we still don’t have meters we can assuredly rely on. Just a bit of news: Apidra, a rapid-acting insulin used before meals like Humalog and Novolog has just won FDA approval to be packaged in a prefilled disposable pen, to be called ” SoloSTAR®.” They’ll be available in pharmacies sometime this year. Apidra and Lantus are both Sanofi-Aventis products. If you use the Lantus pen SoloSTAR®, (Lantus being long-acting insulin most patients use once or twice a day to cover the fasting state), the two pens will come in different colors to help tell them apart. And trust me, there are endless accounts of patients mixing up their rapid and long-acting insulins because the pens or vials look so much the same. However, I’ll have to reserve judgment as what I saw didn’t look that far afield from the Lantus pen: a grey blue vs. a blue grey? What’s so hard about making it in green or orange? I’m an Apidra user after years of using Humalog. For me, Apidra works faster than Humalog which means I need to use less and its quicker action gives you the advantage of injecting during and sometimes after a meal depending on what you’re eating. This takes a lot of the guesswork out making my doses a wee bit more accurate.